CDF took some pictures while I was working on replacing part of the dining room floor. While I was nailing, MD came in the room with her toy hammer and asked if it would work well. I let her try, and then she wanted to use a real hammer. It was heavy though, and she gave it back pretty quickly. The picture below is what the floor looked like after I had cut out a 5 foot by 8 foot section and replaced it with 5/8-inch thick plywood. 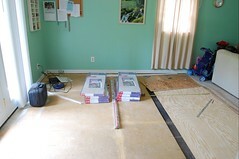 For a while now we’ve been planing on replacing the flooring in the dining room. The vinyl tiles are beginning to wear out, especially where the chairs go, and the whole floor is starting to show its age. Well Saturday, CDF and I got curious to see what was under the tiles and how hard it might be to tear up. So I suggested we pull up a few in a corner, that way it wouldn’t get in our way until the weekend that we had set aside for floor work. It turned out that the floor tiles came up really easy. Actually it was a double set of floor tiles, since instead of removing the old ones, the previous occupants had decided to take a shortcut and put another layer on top. But no matter, they both came up easily. So, encouraged, we decided to see what the bump was behind the couch (where a fireplace had once stood). Surprisingly it was just a extra-thick piece of particle board. Apparently the person replacing the floor after the fireplace had been torn out couldn’t be bother to find the correct thickness and put down 3/4 inch thick board instead of 5/8-inch board. Before I was going to be able to put down the new flooring, I had to cut that extra thick board out and replace it with 5/8-inch plywood. I started after CEF and MDF woke up from their naps and it took quite a while to cut it all out (including cutting into the original flooring to make sure I would have a good fit). 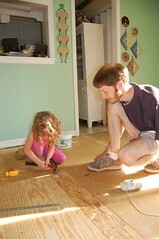 Once we finally had a whole in our floor, it was off to Home Depot to buy the lumber and flooring we wanted. We settled on an white tile design that would match the kitchen. When we got home I discovered that I had messed up the cut on one side of the hole, and had to go back with the jig saw and straighten it out. But that would have to wait for another day. It was late enough and work enough for one day.